The term chronic pulmonary aspergillosis embraces several closely related disease entities including simple aspergilloma, chronic cavitary pulmonary aspergillosis (also known as complex aspergilloma) and chronic fibrosing pulmonary aspergillosis. CPA is a slowly progressive and destructive disease of the lungs, usually of one or both upper lobes, with cavity formation the most common radiological feature. It is arbitrarily defined as being present for at least 3 months. It occurs in non-immunocompromised or minimally immunocompromised patients. Some patients have nodules, which probably represent early disease, and may be mistaken for lung cancer, and have a positive PET scan. Common symptoms are fatigue, weight loss breathlessness, productive cough and haemoptysis (coughing up blood). The disease is often mistaken for pulmonary tuberculosis and both diseases can co-exist. About 25% of patients have an aspergilloma (fungal ball) present, the remainder one or more cavities and/or nodules. Chronic pulmonary aspergillosis is estimated to affect over three million people worldwide, of whom ~1.2 million have had tuberculosis. 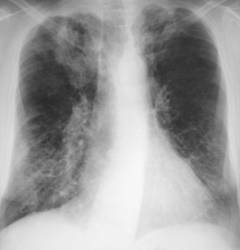 The commonest underlying lung diseases are tuberculosis, chronic obstructive pulmonary disease, sarcoidosis, allergic bronchopulmonary aspergillosis, prior pneumothorax, prior lung cancer (sometimes with lung radiotherapy or surgery) and asthma (including Severe Asthma with fungal sensitization (SAFS). Most patients are not taking corticosteroids or other immunosuppressant drugs, but many are on inhaled corticosteroids or take small doses of oral corticosteroid. Many patients have low gammaIFN responses to standard stimuli. The key diagnostic tests are serum Aspergillus IgG testing, also known as Aspergillus precipitins, and radiology showing one or more cavities or nodules. Aspergillus fumigatus IgG antibodies are detectable in ~90% of patients; alternative approaches to diagnosis include detectable A. flavus or A. niger IgG antibodies, A. fumigatus IgE antibodies and biopsy/excision of lesions showing hyphae consistent with Aspergillus within a cavity. Sputum culture positive rates are ~25% and Aspergillus PCR is more sensitive, but many patients are still negative. Oral itraconazole and voriconazole yield a 60% response rate, although it can take some months for full benefit. response only occurs if blood levels of antifungal are in the therapeutic range. Second line therapy with posaconazole is useful for those who fail or cannot tolerate itraconazole or voriconazole. Fluconazole is ineffective, IV amphotericin B and micafungin also yield a 60% response rate, of limited duration. Surgical excision of simple aspergillomas. For symptomatic patients and those with radiological progression, oral itraconazole, voriconazole or posaconazole. Rescue or primary therapy with micafungin or amphotericin B is an alternative. A few patients have benefitted from gamma IFN therapy. CPA progresses at a variable rate and is often diagnosed late. Severe disease carries a 15-30% mortality in the first 6 months after diagnosis. Death is mainly due to pneumonia and lung bleeding. Those with minor involvement will do well for many years, if progressive lung destruction can be halted. Azole resistance in A. fumigatus is becoming an increasing problem, especially in patients with aspergillomas and those with low levels of itraconazole. 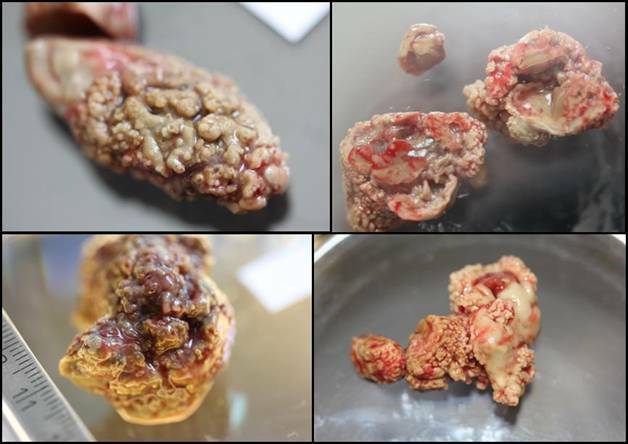 Examples of fungal balls or aspergillomas, surgically removed. CT reconstruction (2 slices) showing one large cavity and some smaller cavities in the right upper lung surrounded by marked pleural fibrosis. The whole right upper lobe is destroyed by aspergillosis. 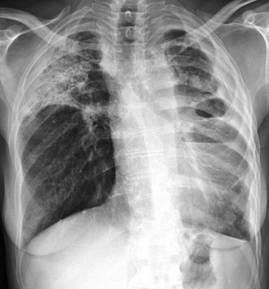 Chronic pulmonary aspergillosis complicating ABPA with bilateral upper lobe changes more marked on the right, with some right lower lobe changes as well. Progression on therapy of chronic pulmonary aspergillosis with enlargement of the large left sided cavity and fibrosis of the left lower lobe.